(Bloomberg) -- The Reserve Bank of India’s efforts to defend the rupee in recent weeks spells good news for the bond market. The intervention comes when the banking system is reeling from a cash crunch, and could lead to more debt purchases by the authority to replenish liquidity. 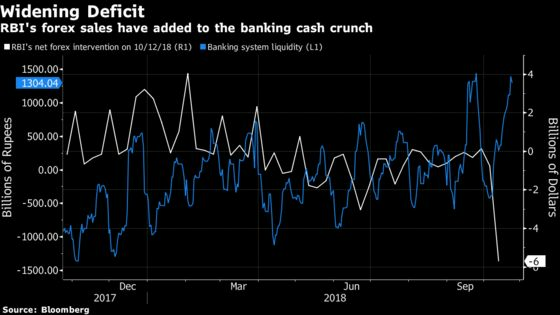 Analysts at Nomura Holdings Inc. and Bank of America Merrill Lynch say the outflows from the banking system because of a festive season and the RBI’s currency intervention is adding to a liquidity deficit, which was near the widest in two years on Wednesday. “We reiterate our standing call that the RBI will issue an OMO calendar to cool yields, stabilize markets and arrest lending rate hikes,” Indranil Sen Gupta and Aastha Gudwani, economists at Bank of America Merrill Lynch, wrote in a note. The central bank sold $5.7 billion of foreign exchange in the week ended Oct. 12, up from $752 million in the previous week, to stem the rupee’s losses, according to estimates by Bloomberg Intelligence. It may end up buying up to 1.3 trillion rupees of debt in the six months to March, said Vivek Rajpal, a rates strategist at Nomura. The RBI has announced 360 billion rupees of bond purchases for October, adding to 200 billion rupees of buying in September. Yet, the infusion has almost entirely been offset by forex sales until mid-October, the BofA Merrill Lynch economists wrote. They expect the central bank to make at least another $35 billion of purchases in the November-March period. “The bond supply-demand dynamics are very favorable in India and we should continue to see yields gradually declining over time,” Nomura’s Rajpal said.